Rally-FrEe is a competitive sport similar to Rally-Obedience (Rally-O). It adds in novel behaviors that are often considered "tricks," such as leg weaves, spins, and bows. Julie Flanery, the creator of Rally Freestyle Elements (RFE), the sanctioning organization for Rally-FrEe, had a unique vision for Rally-FrEe when it was designed. As a Canine Musical Freestyle judge, Julie saw numerous creative routines earn low technical scores because the dogs lacked attention, precision, and strong foundation behaviors. She envisioned Rally-FrEe as a sport that would foster training strong foundation behaviors and encourage freestylers to strive for greater precision, while still maintaining a high degree of creativity. Although Julie created Rally-FrEe for freestylers, she soon realized that it also appealed to enthusiasts of other dog sports, such as obedience and agility. A growing number of obedience and agility competitors love the challenge of expanding their dogs' repertoires, while companion dog owners think of Rally-FrEe as a fun way to venture into the competition ring. In the less than two years since its launch in August, 2012, Rally-FrEe has grown from its base in Oregon across the United States into Canada and overseas, including interest in the United Kingdom, New Zealand, Japan, and South Africa. Freestylers are using Rally-FrEe as a foundation sport, an important part of the training plan for their freestyle dogs. Handlers who are interested in freestyle but intimidated by its dance aspect are drawn to Rally-FrEe as a way to enter the musical freestyle world without the burden of creating a choreographed routine. Beginner freestylers say that Rally-FrEe provides a guide for musical freestyle training, offering organization and structure from Novice to Advanced levels. The signs and behaviors associated with each level are clear, and the free choice stations enhance the creativity aspect, adding fun and variety. In Rally-FrEe the routine (the Rally-FrEe course) is specified for learners, which eliminates the need to choreograph. New students can instead focus on improving the performance of each element. The transitions that are taught in Rally-FrEe (points where the dog changes position relative to the handler) make it easy to start putting together sequences for a routine. On a Rally-FrEe course of any level, there are 15 station signs plus the start sign. The start sign directs the dog to start on the left or right side of the handler. Sign number 15 always indicates that the dog should perform a bow. Except for the start sign, the signs are numbered 1 to 15 to guide participants around the course. Although the number of stations remains constant regardless of the competition level, required behaviors become more challenging as a dog/handler team earns titles and changes levels. showcase a dog's best tricks and behaviors. Although there are some exceptions, the handler is usually between the sign and the dog as they pass each sign. As you progress around the course, some signs may require the dog to change from one side of the handler to the other. For instance, if the dog is heeling on the right and you approach a "Thru to Left Heel" sign, your dog should be on your left after performing the "thru" (a single leg weave). To help negotiate the course, a clip, tab, or other marker is placed on the sign to indicate which side of the handler the dog should be on approaching each sign. Included in every course are four "Free Choice" signs. 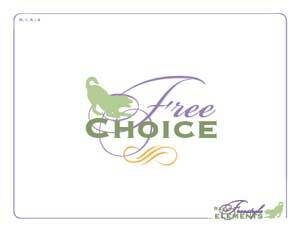 Free Choice signs offer the opportunity to showcase a dog's best tricks and behaviors in the ring. Use a prop, perform a fancy trick, do a basic behavior, or do a more complex version of a basic behavior. Free Choice means it is your choice, as long as what your dog does is safe for you, your dog, and the spectators. About 10 days prior to a competition, participants receive the course map. With this information, you can practice the behaviors required for that course, plan how you will navigate the course, and decide which free choice behaviors to include. Rally-FrEe judging is a bit different from judging general obedience or Rally-O. In many traditional competitive venues, you enter the ring with a perfect score and points are deducted for errors. In Rally-FrEe, you enter the ring with a zero score and earn up to 10 points for each station. The criteria that a Rally-FrEe judge uses to score each sign is based on how well the dog executed the behavior(s) indicated on the sign; if your dog was in precise position next to you before and after the behavior; and if your dog responded to a verbal cue or if you aided your dog by giving a hand signal. Kathy and Troy in the competition ring. High scores are earned when the dog performs the behaviors with precision on a verbal cue. Lower scores are earned when the dog does not perform the behavior according to the sign description and/or if the handler uses large or lure-like hand signals. In addition to earning scores for the dog's performance at the stations, you also earn one to five points for creativity and difficulty at each of the four Free Choice signs. For example, a brilliantly performed "down" at a Free Choice sign might earn a high "10" for execution but only a "1" for creativity and difficulty. Two slightly-less-than-perfect "rollovers" performed one after the other might earn an "8" for execution but a "4" for creativity and difficulty. Rally-FrEe judges also look at three additional components: heeling, attention, and teamwork. The scores earned for these components are referred to as the "HAT" scores. You can earn up to 10 points for each component. Heelwork in Rally-FrEe is defined as "the ability of the dog to remain precisely within a consistent proximity to the handler, while moving in any direction and while performing the behaviors indicated at each station." If your dog tends to work at your side consistently with his/her shoulder (instead of neck) at your leg, that position can still earn high points for heeling as long as the position is consistent. Attention is defined as the "ability of the dog to focus on the handler and the task." Teamwork is defined as the "evident engagement, support and willingness to work together and the apparent enjoyment derived from working together." Hurray for this aspect of Rally-FrEe! It lets you take part in a competitive sport that awards a higher score because there was apparent enjoyment derived from working with your canine partner! The scoring system, like all aspects of Rally-FrEe, positively supports and awards training achievements. In Rally-FrEe , the maximum possible score is 200. At all competition levels, a qualifying score is 125 or greater. Because of the opportunity to earn creativity and difficulty points at the Free Choice stations, and the opportunity for additional HAT points, you can still earn a qualifying score even if you earn a zero at one of the stations due to some mishap. The scoring system, like all aspects of Rally-FrEe, positively supports and awards training achievements. New-sport challenges, but benefits, too! If you are new to Rally-FrEe, you may encounter a few training challenges initially. On the other hand, you will also find that you and your dog benefit from Rally-FrEe training in numerous ways. For instance, in Rally-FrEe, dogs work on all four sides of the handler: left, right, in front, and behind. If you have trained for obedience and Rally-Obedience, you may find training your dogs to "heel" on your right side challenging simply because your muscle memory has been developed for working your dog on your left. In my experience as an instructor, dogs often understand this new position relative to their handlers faster than their handlers. The benefits of training right-side heeling are multifold. Handlers benefit physically since they no longer need to angle their head and neck to the left constantly. Handlers also benefit because they develop enhanced training skills as they train dogs not only for right-side heeling, but also for other novel and complex Rally-FrEe behaviors. Dogs benefit physically when worked equally on the left and right side of their handlers. Working on both sides of the handler helps the dog develop balanced neck and shoulder musculature, since the dog is not angling its head and neck to its right constantly while moving with the handler. As a non-impact activity, Rally-FrEe provides opportunity for physical exercise without the jumping required in some other sports. Rally-FrEe provides a number of other benefits for physically fit dogs as they learn Rally-FrEe behaviors. Dogs develop more flexibility and core strength by doing behaviors such as bows, spins, and leg weaves. Their body and rear-end awareness increases as they learn pivots in all four positions, backing up, and backing around the handler. Dogs that are flexible and more aware of their bodies are less prone to injury, which is a definite benefit for companion and performance sport dogs. As a non-impact activity, Rally-FrEe provides opportunity for physical exercise without the jumping required in some other sports. Can a dog that is not young or physically fit also benefit from Rally-FrEe training? Absolutely! In the Rally-FrEe Alternative Division category, older dogs and dogs with physical limitations perform many of the same behaviors as those found within the Regular Division category (leg weaves, as an example). Blind or deaf dogs may work on-leash at all levels of competition in the Alternative Division. In Rally-FrEe, handlers are challenged to notch up training to a higher level by teaching their dogs to perform simple and complex behaviors on verbal cues. Achieving responses to verbal cues has benefits beyond Rally-FrEe as well. Of course, if your ultimate goal is to compete in Canine Musical Freestyle, your dog will need to respond to verbal cues because choreographed hand and arm movements may not resemble the hand signals your dog knows. However, the benefits are not only for musical freestyle. When you teach a dog to respond to verbal cues, you have opened up a new level of communication. As you and your dog work and perform together, the dog will be more focused on you, listening for cues. Training toward this higher goal, you and your dog become a team with a stronger working relationship. If you are a positive-reinforcement trainer who likes to try new things, you will love training for Rally-FrEe. Rally-FrEe lets you fine tune clicker training skills and observational skills as you train a wide variety of well-defined and "free choice" behaviors. With Rally-FrEe, training moves to a higher level; your dog becomes savvier about understanding how to acquire reinforcement and learning its place as your working partner. Shaping a circle using an ex-pen. Rally-FrEe training is ideal for experimenting with an array of training aids. Training your dog to spin in place is a snap with a target stick. Have you tried standing platforms? Michele Pouliot's platform protocol is ideal for teaching Rally-FrEe left, right, front, and behind positions. 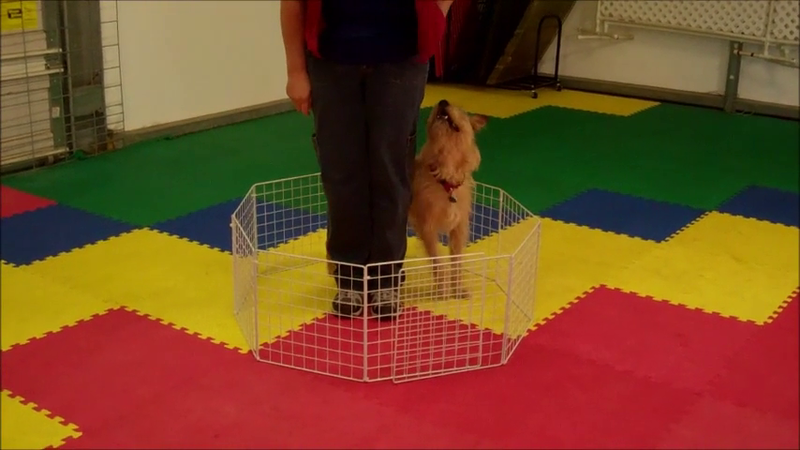 A round "pivot" platform not only teaches your dog about rear-end awareness, it also makes teaching pivots and side passes easy. Mini-gates or ex-pens are the environmental aids of choice for shaping your dog to circle around you forward and backward. The progression from Novice to Advanced Rally-FrEe competition levels requires a logical training progression as well. Behaviors required at the Novice level are foundation behaviors for the more complex behaviors at the Intermediate and Advanced levels. By following this progression of increasing difficulty, you advance to the more difficult behaviors with a strong foundation. This strategy helps prevent frustration, which can be a powerful de-motivator for both you and your dog. If a more complex version of a behavior seems difficult for your dog, identify any foundation weakness and strengthen the necessary basic behaviors before progressing again. Rally-FrEe allows you to continue through the competitive levels spending more time generalizing learned behaviors and less time training brand-new behaviors. This means that training for Rally-FrEe continues to be fun and rewarding. If you are training, or planning to train, your dog for any sport, training for Rally-FrEe will provide a solid foundation. To teach your dog to perform behaviors on verbal cue, in Rally-FrEe you learn how to fade food lures, as well as hand and body cues. You learn how to get working duration when you set a Rally-FrEe goal for the dog to do fifteen behaviors plus heeling in order to earn a reward. Visit the Clicker Training Store for Rally-FrEe instructional DVDs, signs and sign descriptions, and other Rally-FrEe products. Watch videos of Rally-FrEe behavior performances, competition runs, and training segments at the Rally-FrEe YouTube channel. Visit the Rally-FrEe website for membership information, class locations, and more. Training Rally-FrEe behaviors makes you aware of how your dog's position relative to you affects your dog's ability to understand and perform the same behavior on your left, on your right, in front of you, and behind you. Training similar behaviors, such as clockwise and counterclockwise spins, points out the importance of clearly defined verbal cues. All together, these lessons help you become a trainer who clearly conveys your goals to your dog and minimizes training frustration. Rally-FrEe may be the ideal activity for a dog that can no longer do obedience or agility work due to advanced age or accidents. A handler who faced retiring her agility dog decided to try Rally-FrEe and says it was the perfect solution for her dog. While she was sad at first about the decision to stop doing agility, and worried that her dog would miss the sport, it was clear right away that the dog loved learning new behaviors. If you are considering trying something new with your dog, or searching for positive training techniques that make training rewarding for you and your canine partner, Rally-FrEe is something to try! If your next goal is to compete in a sport like freestyle, obedience, agility, or treibball, or if you just want new options for physical and mental activities that your dog enjoys, Rally-FrEe may be the next step. A new sport that helps develop a strong training foundation, a broad repertoire of behaviors, and an enduring partnership with your best friend is surely a positive experience. Kathy Weaver, CPDT-KA, RFE-CI, teaches musical freestyle, Rally-FrEe, treibball, tricks, and nose work classes in the Seattle, WA, area. She has titled dogs in obedience, herding, Rally-O, musical freestyle, Rally-FrEe, and nose work. 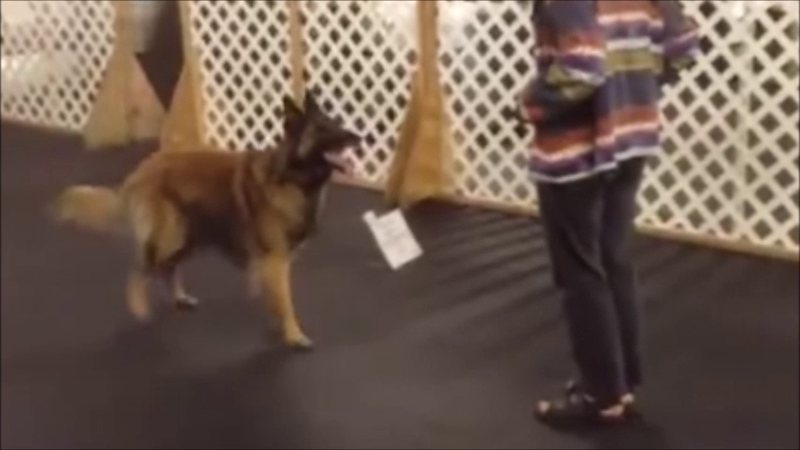 Kathy competes at the Champion level in Rally-FrEe with Troy, her Belgian Tervuren. She encourages her students to always train with understanding and compassion for their canine partners. Learn more about Kathy from her website.